Earlier this month on Monday February 5th, the Dow Jones plunged nearly 1600 points. Percentage wise this represented a 6.2% decline. It was the largest single day drop before coming off the bottom but still ending the session more than 1,000 points lower. This is a lot to digest. And it’s not only in the U.S. In many other markets around the world volatility has increased in the last few weeks. We are seeing more speculation from both buyers and sellers. In uncertain times like these, the best asset to hold right now may actually be cash. As an asset class, cash is very stable in the short and medium term. It’s useful to sit on some money while waiting for a financial market storm to pass. Investors who have a large cash reserve can take advantage of any opportunities on the horizon should the corrections we experienced in early February is only the beginning of a bear market. On Monday February 19th the American stock and bond markets are closed for the Presidents Day holiday. But stock futures which continue to trade are lower. “Equity markets started off the week on a lackluster note, and the absence of important news flows encouraged dealers to exit the equity markets,” said David Madden, a CMC Markets UK analyst, in a note on marketwatch.com. Some traders will try to time the market or bet against the market by using sophisticated vehicles such as leveraged ETFs or inverse ETFs. But that’s a zero sum game and is hard to win doing that. It’s better to wait and see rather than making a gamble. Another worry investors have is inflation. Although it has been tame for many years in the past, inflation is starting to creep higher. Starting from 2015 inflation has been rising. But even if stocks post positive returns amid increased volatility, higher inflation would ultimately reduce real returns or both equities and bonds. 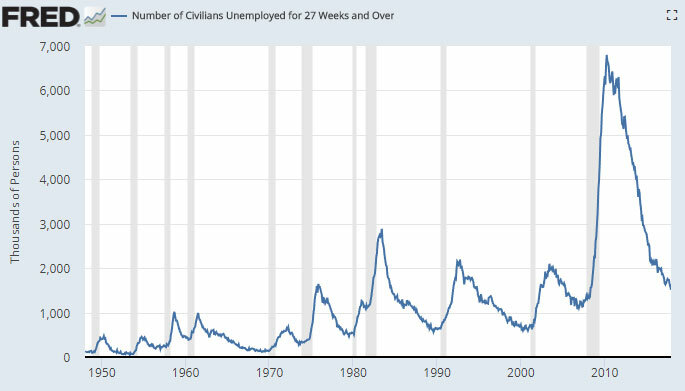 According to the Federal Reserve Bank of St. Louis, the number of people who have been unemployed for 6 months or longer has been falling since 2011. The graph below shows how this number behaves in a cycle, moving up and down over time. After each time the rate falls over multiple years it eventually changes course and moves back up, usually very quickly, and pretty much always accompanied by a recession, which are represented by the overlapping vertical gray bars. As the population grows in the U.S. the bottom of these cycles adjust to higher levels over time. It has fallen from nearly 7,000 to about 1,500 now. It doesn’t have much room to drop from here. And when it rebounds it will probably result in millions of Americans losing their jobs. Although history doesn’t repeat itself exactly, at least there are trends and recognizable patterns that we can use to help us make better long term decision plans. That doesn’t necessarily mean the next recession is coming right away. But having some extra cash as a cushion can certainly come in handy if the economy slows down, followed by further declines in the stock market. That’s not to say investors should sell all their long positions. Timing the market often doesn’t work. Whether the stock market fully regains confidence in earnings and the broader economy will become more clear in the next several weeks. But in the mean time, instead of looking for the next stock or bond to buy, I would take a step back and wait for the volatile markets to find some stability before risking any more of my hard earned money.